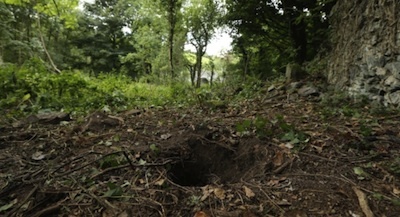 A metal detector enthusiast searching on public lands found the items in a hole dug deep in woodland in Castlereagh, an east Belfast stronghold of the loyalist paramilitary UVF (‘Ulster Volunteer Force’). A total of sixteen modern semi-automatic guns were found hidden inside a barrel on Friday, August 23rd, including powerful Glock semi-automatic pistols and 800 rounds of ammunition. The arms haul was described by the PSNI police as the “largest find” in several years. It comes amid fears over increasing loyalist tensions on the streets of Belfast. There are growing concerns that the UVF, or a section within the organisation, is planning to return to a campaign of violence. The parkland at Lisnabreeny Walk where the weapons were found, near Lagan College, was landscaped and upgraded in recent years, suggesting they were hidden very recently. The discovery comes just weeks after hardline DUP councillor Ruth Patterson expressed support for a large-scale gun and bomb attack on republicans, and amid vocal expressions of support for a return to violence in grassroots loyalism. The leader of the SDLP, Alasdair McDonnell described the find as of “major significance”, with “enough weapons to equip a fairly significant body of men”. Local DUP representative Jimmy Spratt said he understood the weapons were only recently moved to the area. South Belfast SDLP representative Claire Hanna echoed concerns of renewed conflict. “Online there is very frightening sentiment being expressed by individuals, a bloodthirsty desire to return to the use of weapons. It is extremely worrying,” the Balmoral councillor said. Sinn Féin’s Martin McGuinness credited the PSNI with the discovery and said the source of the weapons should be identified. “Good news that 16 hand guns have been recovered by Police in East Belfast, they deserve our thanks,” he said. Later in the week, the PSNI said it had found mortar rockets in south Armagh which it blamed on republican dissidents. It said it had been warned of an abandoned device two weeks previously, on Wednesday, August 14th. There was no explanation for the delay in responding. The alert took place over three days outside the village Cullyhanna, beginning on Tuesday, with wild claims in the media that the mortars were of a Middle Eastern design, and had been intended to be used to shoot down a PSNI helicopter. Sinn Féin councillor Colman Burns said he was concerned the devices were in the area for so long. “It is very worrying that if there is a bomb, people could have been driving past it for two weeks,” he said. A statement from the ‘South Armagh Brigade’ of Oglaigh na hEireann subsequently claimed responsibility for the devices. It said that the attack had been abandoned after their target failed to appear.